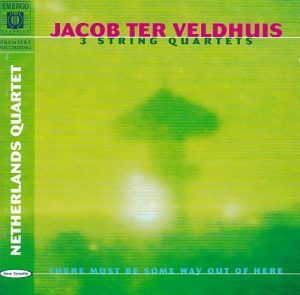 Born in 1951, Dutch composer Jacob Ter Veldhuis started as a rock musician, although he is also a conservatory-trained composer. His stylistic stance as expressed in the liner notes terribly smacks of philistinism – “in contrast to the other contemporary art forms, new music is engulfed in clouds of intellectualism put about by composers, scholars and other experts. Such an academic approach to music does not interest me. In music I express myself emotionally, spiritually, rather than rationally. Much new music is bookish and lacking ‘duende’ (magic, spell), the vitality of other musical genres. I try to make my approach to music as elementary as possible. I compose with my ears, which is – strangely enough – rather exceptional these days”. That kind of populist proclamation makes me see red whenever I meet it – and it is often met these days: when the subject comes to contemporary music, philistinism is hip. In addition to which, I’ve usually found the music that derives from that kind of “philosophy” absolutely trite and derivative, saccharine and shallow. Fortunately I listened to the CD before reading the liner notes, and the music is better than that. Quartet No. 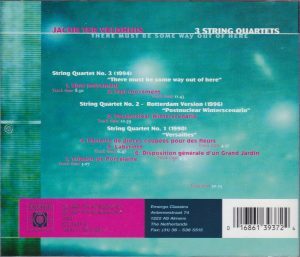 1, from 1990, sounds like the kind of “Classical meets World Music” style that the Balanescu or Kronos Quartets have illustrated: catchy tunes (very Prokofiev-sounding), dance-like repetition, rhythmic syncopation, wistful-sentimental in the slow movements (the quartet alternates fast-slow-fast-slow). The quartet reminded me of Terry Riley’s Salome Dances for Peace. It is titled “Versailles” after the palace and Ter Veldhuis provides a programmatic explanation to each movement, but I find it bogus. If you want music for or about Versailles listen to Lully and Charpentier, Ter Veldhuis’ quartet stands on its own. SQ No. 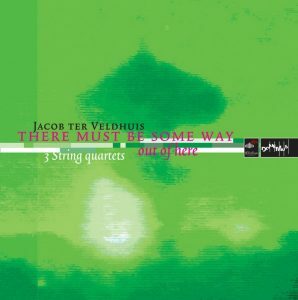 2, from 1992 (played here in a revision from 1996, written for the Netherlands Quartet), written in the aftermath of the first Gulf War and subtitled “Postnuclear Winterscenario”, is a continuous slow movement, running 11 minutes, mourning and bleak, and here the bleakest moments in Shostakovich’s last quartets can come to mind, with whiffs of Britten maybe. Prokofiev, Shostakovich, Britten: none of this is cutting edge, it’s all quite predictable, but it’s pretty, and easy listening. Although following the same principles, and composed of a slow movement followed by a fast one, SQ No. 3 (1994) is more elaborate and sophisticated in its harmonies, rhythms, architecture and expression, and for that reason the most impactful of the three. The quartets of Kevin Volans come to mind, but this one has genuine originality. TT 51 minutes, booklet presentation is irsomely hip, with some words capitalized apparently at random. Well, better not read the liner notes anyway, just listen to the music.